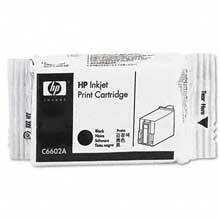 The HP C6602A is a Single-color,Black, Ink Cartridge. For Single-color printing in Red, Green Or Blue use cartridge # C6602R for Red, C6602B for Blue or the C6602G for Green. All of the C6602 series inkjet cartridges are designed to print 96 dpi and typically deliver over 7 million characters per cartridge for economical, non-stop printing.